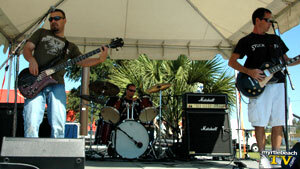 Over the past year, we've caught several live performances of popular local rock group EASON. Sadly, we caught their last local performance at the same venue we first featured them on our show, the Dead Dog Saloon in Murrells Inlet, South Carolina. With each of the talented band members taking on new challenges apart from the EASON group this-coming year, it was with heavy hearts we drove the hour each way from our studios to catch their final local performance together this past Sunday evening. Watch the video above, that has part of their final performance at Dead Dog Murrells Inlet, mixed in with snippets from others venues we featured them at on Myrtle Beach TV over the past year. In episode 21, "Chili Pizano", at the Oktoberfest at Dagwood's Deli & Sports Bar in Surfside Beach, talented local band Gogglez Pizano takes the outdoor stage. The three musicians, interviewed first by friend Bob Bradley, then interviewing themselves, were almost as entertaining off the stage as on -- comedic, all the way around. Find out why they named their band such an odd phrase, and what the heck it means! Pro-circuit southern rock band Little Soul, who rocked the stage at Surfside Live for three days during Fall Bike Week, were featured in episode 20 of the show. 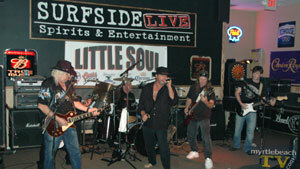 Watch the HD version of Little Soul at Surfside Live by clicking on the link or the photo of the band to the right. Playing for the fun of it, a mix of musicians at Cozy O's were featured in episode 19 of the show. Not Yet Rated performed at Club Boca, and Harlequin performed at the North Myrtle Beach Chamber's Business After Hours at Grand Strand Resorts. Red Emotion Riot took the stage at Club Boca for the Surge's first birthday, and viewers were treated to original songs by the talented musicians and an interview with Daz after their performance. Viewers were treated to the Sanson Brothers at HB Spokes on Hwy. 9, as the last band that performed at the popular club before the devastating fire the following morning. 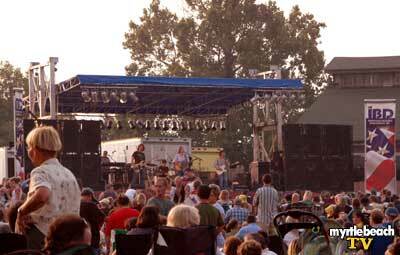 Also featured in the same episode was Eason's outdoor performance at McLean Park in North Myrtle Beach, as part of the North Myrtle Beach summer concert series. Want us to check out a local band that writes and plays originals? 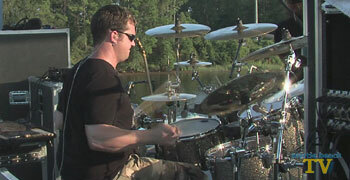 We also check out bands that do covers exceptionally well, or with an original twist. Visit myrtle beach TV on myspace and drop us a note, and we'll check them out, and possibly record an interview and live performance to air on the show.